It's incredible how much easier life can be with your dog by your side! We're lucky to be able to build such loving relationships with such amazing animals. Unfortunately, we can't bring them everywhere we'd like to go. That's why it's important to take the proper steps to register your dog as an Assistance Dog (service or ESA) or a therapy dog if you feel your pup adds to your quality of life. Dogs can reduce our anxiety, help us physically get around, provide emotional support when we need it the most, or help others in hospitals and/or hospices. If your dog provides this kind of comfort, then you can follow these steps to register your dog as a service animal, emotional support animal, or therapy animal. 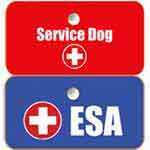 First, it's important to understand what type of assistance category your dog falls into. 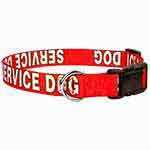 Each category provides a different kind of support and function to their owner/handler or to others. Each category offers different legal rights as well. Basically, there are three types of assistance animals. 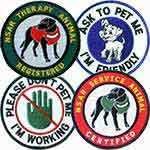 Service animals, emotional support animals, and therapy animals. Service dogs are trained to help with various disabilities and can assist their handlers in many different ways. Service dogs are allowed in all public places. An Emotional Support Dog is a dog that doesn't need any kind of special training but does provide the care and comfort their owners need. A Therapy Dog is a special kind of pup that provides comfort to other people. When you register your dog, it's important to understand where they can and cannot go in public. Service Dogs can go anywhere and everywhere. They're actually considered to be medical devices that are essential to their handlers. They're not exactly considered to be pets. Emotional Support Dogs can live with you even if you live in a place with no-pet housing rules. Emotional Support Dogs can also fly with you and sit right next to you on a plane. Airlines, housing, and other establishments cannot charge fees for Emotional Support Dogs. Therapy Dogs don't necessarily have special access to public places. They must be invited in before they can enter a hospital, home, restaurant, or any other public space. Once you understand what kind of training your dog needs and what kind of assistance they provide, you can move forward to register an emotional support animal, therapy animal, or service animal. 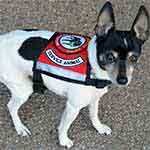 Registrations through the National Service Animal Registry are quick, easy, and very affordable. Simply click on the appropriate category for registration and follow their easy instructions. 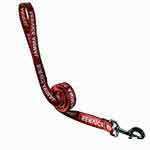 You'll be given options to purchase different products to make sure your dog is good to go. For instance, you'll receive certificates, ID cards and leash clips, and the option of receiving electronic copies of your registration documents. 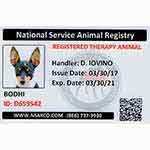 Depending on your dog's type of registration and your assistance animal needs, you can choose what kind of registration kit you and your pup require. If you move around a lot and travel is a big part of your life, you may want to opt for the premium kits to keep you and your assistance dog protected. Check out their website today for more information!